Easily unclog your print heads without removing them. Save money by reducing expensive printer technician charges. Reduce the downtime of your printer caused by clogged print heads. Improve the print quality of your printer with cleaner heads. 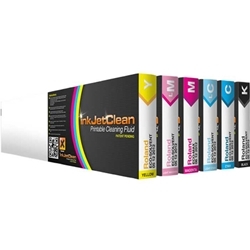 InkJetClean is a revolutionary new product which allows you to unclog and clean your print heads without removing them from your printer. Unlike the OEM cleaning formulas which are made of solvents that are a component of the OEM inks, our proprietary cleaning formula is designed to actually break down the inks and clean out all of the unwanted deposits throughout the printer's internal ink transferring and delivery systems.